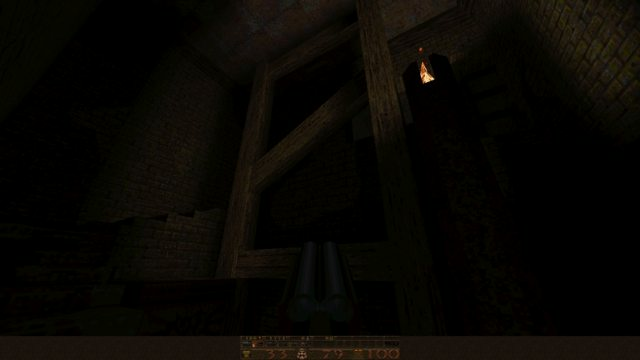 I was playing through the first episode of Quake in DOS v1.06 (installed straight from an OEM CD I got with a joystick in 1998) and noticed the lighting in the DOS executable seemed more vibrant than in super8. I took a screenshot in v1.06 and then another in super8 and it seems like super8 does not render overbrights properly, perhaps not at all. 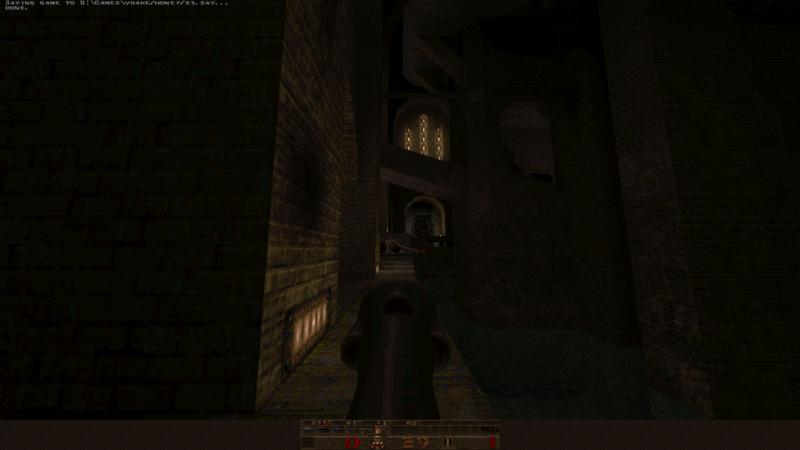 Quake v1.06 for DOS. The lighting is stark and high-contrast. Qbism super8. The lighting is flat and subdued. Makaqu also displays overbrights correctly, which is strange because isn't super8's renderer based on Makaqu's? I would definitely call this a bug. Do you think you can restore overbrights to the same intensity they have in the DOS executable? An additional problem I discovered is that the entire view is squashed when you have the classic status bar with background enabled. The view squashing problem did not happen in QbismS8 v140 (just tested) so it appeared at some point between then and now. See comments on github- generally reset everthing, use latest version, delete old junk, some inconvenient design decisions. The overbrights issue is the one that I'm surprised about. Regarding view model clipping looks like 640x360 resolution? Finally, if everything is 'clean', would you mind posting your config and the s8report? My resolution is 1920x1080 in super8, 320x240 in 1.06, and 1280x720 in Makaqu. Those images I posted were imgur thumbnails. Overbrights still do not render and the super shotgun still distorts even on a completely clean install. Gamma doesn't seem to affect overbright rendering--however, the s8pal palette can give the illusion of there being overbrights due to its high brightness and intensity . This illusion is immediately dispelled when you change r_palette to "palette" or "orig-pal" (which I would argue should be the default, and s8pal the option). bind F6 "echo Quicksaving...; wait; save quick"
bind F9 "echo Quickloading...; wait; load quick"
sv_cheats[0/1] Toggles allow server cheats. I switched the resolution between 1920x1080 and 1024x768 and found that the SSG displayed the distortion at both resolutions so I did some experimenting. The view model offsets are incorrect by default. That's why, even with corrected vid_nativeaspect, they look "wide" compared to QuakeSpasm's. scr_ofsz 2.5 and scr_ofsx -4 make the weapon models look correct, and the SSG no longer distorts. "Agreed that the original Quake palette looks bad with this engine, which is why the s8pal was created." That's a horrible excuse. If you can't render the game properly with the color set it was originally created with, why even bother making a software engine? You broke the lighting system (removing functionality that even the DOS version has, namely overbrights) and then you create a garish new palette to cover it up? No, that's not going to fly. The lighting system is broken. 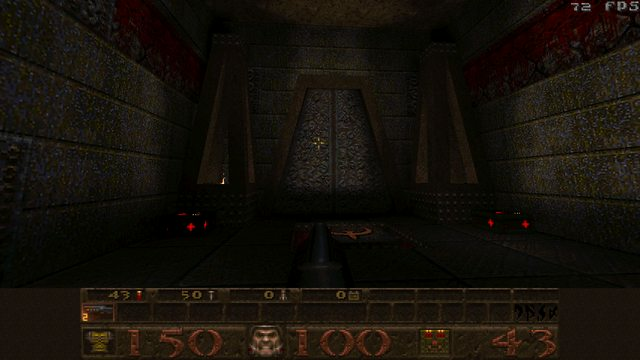 If it looks bad with the original palette, then it looks bad period because the game was designed for those colors, the entire reason why I would ever play with a software renderer at all is because of the original 256 color palette that Id Software created, that all of Quake's art was done in, that creates the grimy atmosphere that has drawn players to the software engine all these years, and then you say that "looks bad". No, the lighting "looks bad", because essential lighting functionality is broken in super8. Are you seriously saying you care so little about your own work that the Band-Aid solution of a distorted, oversaturated palette that I turned off the moment I loaded super8 for the first time is "good enough"? You're offering a software rendered engine. 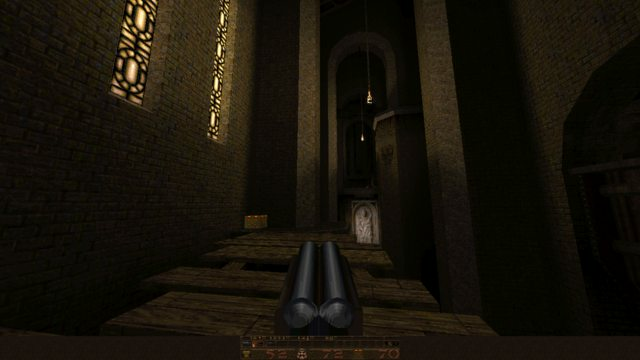 Your target audience is people who remember Quake as it came off the CD in 1996. Who want a stable, mature, limit-removing software port that can carry on that look, quite literally the way Quake was always meant to look because GL was an add-on made after the fact, and then add all the nice features of modern GL engines like water vis and colored lighting and fog and gigantic maps on top of that. But the foundation is the classic Quake atmosphere that would make people even want to use a software engine instead of QuakeSpasm. That's why ZDoom is so popular, it's why eDuke32 still has a software renderer (and people still use it), it's why people have kept asking for and using software rendered ports for games despite the massive inherent advantages of using a GPU. Because those 256 color palettes the old games were made in mean something, because there is artistic value in them as they are. This target audience could be all yours. They have no alternatives--Engoo is unfinished and buggy, Makaqu has been discontinued, neither support modern editing features. All you have to do to get and keep this audience is to repair the parts of the renderer that have regressions. Thanks for posting the config and report above. I didn't see anything strange here. Although this helped reproduce the behaviours, the only true bug within the scope of the engine is the vertical squishing. Some further explanation is on github. History- The engoo Quake engine introduced colored lighting in an accurate and flexible way. Super8 introduced a faster but more limited method... and also a bit different, which some have enjoyed. Plus it would have been boring just to copy the same thing. The colored lighting is immediately palettized from 24-bit color to 8-bit, which is fast but leaves little room for adjustment or subtlety after-the-fact. Over a few years engoo got faster, computers got faster, super8 got only a little faster but added features like big map support. Frankly the color limitations aren't worth any remaining speed difference for someone seeking faithful color, but it would be a major project to combine the best of the two engines (plus recent Makaqu developments) at this point. The advantages of super8 color processing are still useful to older computers or DOS, there was an active DOS port on Vogons forum a few months ago. Also a few get into the palette bending or fisheye. Rather than rebuild Q1, recent dev community effort was put into Q2 ref_soft. A much more satisfying engine, largely due to features like texture flags that make it easier for the renderer. Others have recently picked up this baton for both DOS and Windows including new colored lighting ASM(!) Again on Vogons. The creator of Makaqu was building core engine and render improvements (with yet different goals than super8 or engoo) and perhaps may return to it. So are overbrights broken because you use some kind of GLQuake-like method to light everything in 24-bit color and then smash it down to 8-bit color in real-time? Doesn't that mean you could model overbright code after the way QuakeSpasm or FitzQuake Mark V does it? As for the major project, I'm getting the developer of the ECWolf source port a copy of Visual C++ 6.0 so he can port Engoo to modern compilers. Then I'll probably have to find a new coder/maintainer since Blzut3 likely has too much on his hands (Zandronum, ECWolf, paid work for Google) to work with "Engoo++" after that and I can't code, but at the very least I hope to find a way to get Engoo to a state where the music works and the limits are raised (hell, if it's just "find the numbers for the limits and replace them with bigger numbers", I could even raise the limits myself if someone told me where to find the numbers). Sorry to hear that our goals are just not aligned. It's hard being a fan of the original look nowadays, with the leading ports all being GL, WinQuake Mark V being capable of loading big maps like super8 but very incomplete and with no usability features like interface scaling, and Makaqu 1.4 being extremely crash-prone. 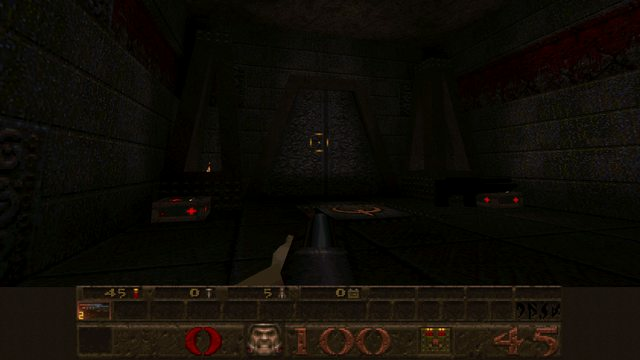 If I knew C++ I'd be working on a fork of one of these engines right now, trying to bring together Engoo's graphics, super8's interface (your crosshairs are the best Quake crosshairs period--better than QuakeSpasm's and better than any QuakeWorld client's), and QuakeSpasm's stability. 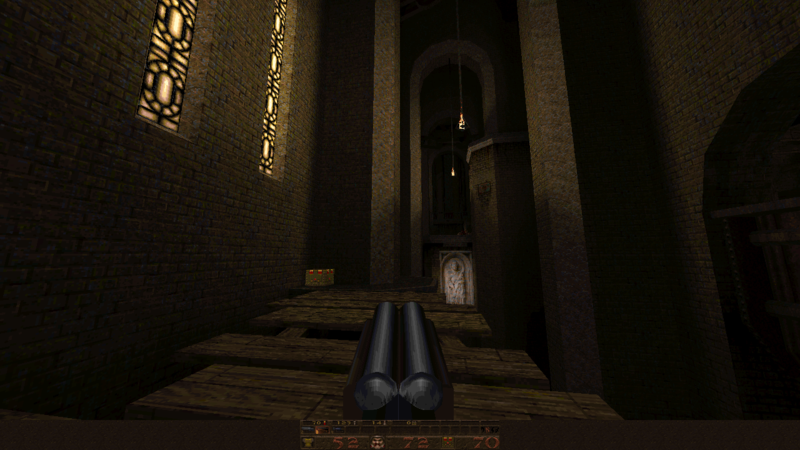 Honey in WinQuake Mark V. Unfortunately the status bar is not very useful at this resolution without scaling. The lack of fog extremely dark shadows combined with the intense overbrights make Honey very gloomy and unsettling in this renderer! I did try Honey in Engoo--the hub level runs, but with serious rendering errors. The two main maps crash because they exceed Engoo's limits. And just because this is all getting a little depressing, something fun! I thought about a more faithful fork a few years ago and realized it would be a 'reboot'. The first step was http://super8.qbism.com/2011/09/bjp-enh ... index.html which should handle big maps up to the Marcher Fortress era (no fog IIRC). Really got zero feedback on it, and at the time there were 3 other faithful-ish projects going on- QuakeForge, Engoo, and Makaqu. If you can provide me with Windows binaries I will be glad to try that fork (I also daresay you would have gotten more feedback if you had provided such binaries too!). If it works better than WinQuake Mark V I might end up using it fairly often. I just don't see loading "big maps" and being faithful to the original renderer as mutually exclusive. 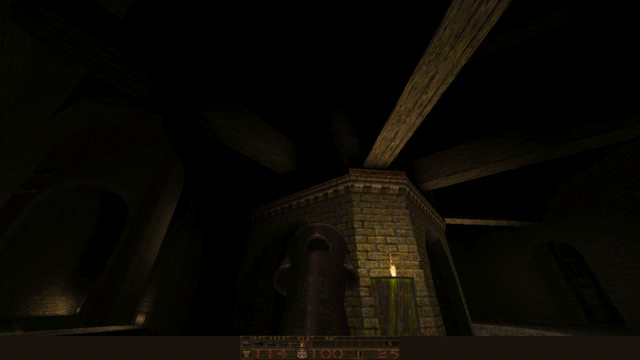 Those Honey screenshots I made in WinQuake Mark V--what do you think of them? 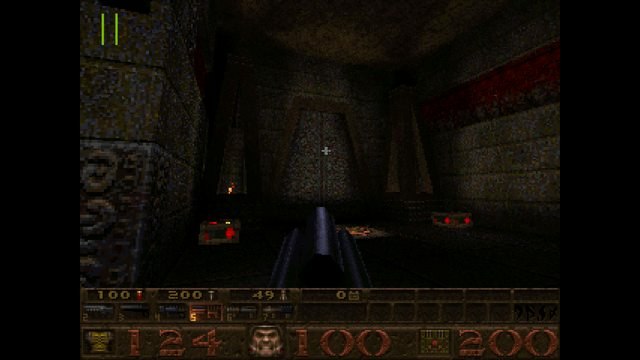 Obviously the shadows are a lot darker than QuakeSpasm (but that's mostly down to the lack of ambient light in DOS Quake/WinQuake) and the engine doesn't support fog but I like them. The sense of overwhelming darkness and morbid desolation is what draws me to Quake. A bit of fun--apparently since the first map of Honey is named "start", Engoo tries to load the original start map's lighting data for it if colored lights are turned on and the MH 2009 colored light pack for ID1 is installed, and gets confused. It's not packaged well... the exe is in the 'Release' folder! Usually I'd prefer lighting to indicate depth rather than fog. Honey for example relies on the fog to give definition to shapes and to provide depth. That's OK, and clearly intentional, but without the fog we see that lighting is very basic and some detail lies in complete darkness. WinQuake Mark V does do a great job of picking up subtle lighting between almost-dark and totally dark. Going back in time to around 2008 or 2010, we'd be in much better shape if magically the Q1 community all adopted the Q2 map format and backported it. Real built-in colored lighting and surface flags. Then we wouldn't have these protocol/ hack issues with colored lighting, transparent surfaces, and proper directory structure. But it's always been like herding cats.